Graduation is on our mind this month and there have been lots of very cute ideas popping up on Pinterest. 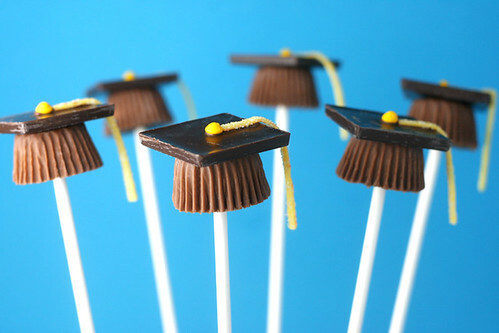 We found these adorable Graduation Candy Cup Caps from Bakerella. Perfect for a fun graduation gathering and could also be adapted to be cupcake toppers! If you are planning a graduation party, you should visit our Printswell sister site where we have invitations for graduation parties and graduation announcements on sale at 25% off. We love that so many include options for photos, especially this one by Modern Posh, which features a picture from when the graduate was a little boy and a picture of him now. They all have such a modern and youthful vibe, especially the colors in these announcements by Take Note Designs and Prints Charming Papers.